Sadguru Sant Shri Ram Maruti Maharaj is one among the eminent saints in Maharashtra. Maharaj took birth in 1856 at a village named Pen (Raigad Dist.) in Maharashtra. Family name is Deshpande. Shri Maharaj was born on “Mool” Nakshatra. It is a common belief that for those born on Mool Nakshatra, a Nakshatra shanti is recommended to be performed for the well being of the father of the child. Hence, a shanti was performed by the parents of Shri Maharaj; especially since his father was on death bed. However, nobody was aware that the child was not a normal one, but rather a Parahbrahma Swaroopa and an incarnation of “Maruti”. 9 days utsav celebrated at Samadhi Mandir in Kalyan. Every day various religious programes are organised. Sadguru Sant Shri Ram Maruti Maharaj is considered one amongst the foremost and eminent saints in Maharashtra. 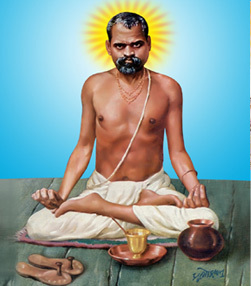 Shri Ram Maruti Maharaj was born in 1856 at a village named Pen in the Raigad district of Maharashtra. His family name was Deshpande. Shri Maharaj was born on “Mool” Nakshatra. It is a common belief that for those born on Mool Nakshatra, a Nakshatra shanti is recommended to be performed for the well being of the father of the child. Hence, a shanti was performed by the parents of Shri Maharaj; especially since his father was on death bed. However, nobody was aware that the child was not a normal one, but rather a Parahbrahma Swaroopa and an incarnation of “Maruti”. !! Govinda Rama!! Gopala Rama!! The mantra enchanted by HH Maharaj ji along with Sri Ram Jai Ram Jai Jai Ram. Maharaj’s “Pothi” was first published in 17.09.1978 written by Sri Anant Yashwant Gadkari-Kalyan (Baburao Gadkari) /Thane. Maharaj once reached Sri Anant Yashwant ji’s house when Gadkari ji was 6months old baby and took him on his lap and started jumping high in meditative lotus posture. 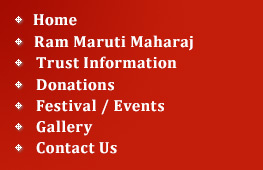 The Name “Ram Maruti” itself is a Mantra. Name Ram is mokshadayi and Name Maruti is Bhakthi dayi. It is said that “RAM “ name itself is a Mantra the shlok is “ Ram eva param Bramha , Ram eva paran tapa,Ram eva pramtatva Shree Ramo brahma tarakm” Param Shiv enchants the Ramnam Mantra By the devine name Ram it denotes the Parabramham , the pranava in the name denotes moksh dayee. The ‘Ra’ kara is a tatvam asi roop (Tat pada vachya Parameshwara)‘Ma”kara is tvam pada vachya (Jeeva) and the ‘A’ (asi pada is ‘you’). It is also said that ‘R’ kara is Agnibheej which wipes the mano malah (The dirt in mind).’A’ kara is Suryabheej which eliminates the agnana (thama) and ‘M’ kara is Chandrabheeja which eliminates thrividha thapa (Adyathmic, Aadibhouthik & Adidaivik) and enhances sheethalatha (Calmness). ‘R’ kara is vairagya hethu ‘A’ kara is gnana hethu and ‘M’ kara is bhakthi hethu. Lord Parshu Rama (The incarnation of Lord Vishnu) has referred meaning of ‘Rama” nama as..